Bengaluru: Until recently, people thought that former PM and JD(S) chief HD Deve Gowda would win from anywhere he contests, but now it looks like he has a lot to be worried about. The fact that he has still not decided on whether he would contest from Bengaluru North or Tumakuru is an indication that Deve Gowda has found himself in a spot of bother. According to sources, Deve Gowda has learnt that Siddaramaiah's followers, Yeshwanthpur MLA ST Somashekar, Byrathi Suresh from Hebbal and Byrathi Basavaraj from KR Puram all in Bengaluru North Lok Sabha limits are looking to avenge the defeat of their patron who was defeated in the Chamundeshwari Assembly election in May. Gowda had pitted another Vokkaliga GT Deve Gowda against Siddaramaiah who defeated him in his own backyard in Mysuru. "Now that there’s an opportunity to avenge his defeat, why will Siddaramaiah's followers forgo it?" said a source. Bengaluru North was considered as a safe bet, until recently for HD Deve Gowda who has given up his Hassan seat for his grandson Prajwal Revanna, and Tumakuru too was another safe alternative. Out of the eight MLA seats in Bengaluru North, the Congress won five, JD(S) won two and BJP obtained one seat in the May Assembly elections. 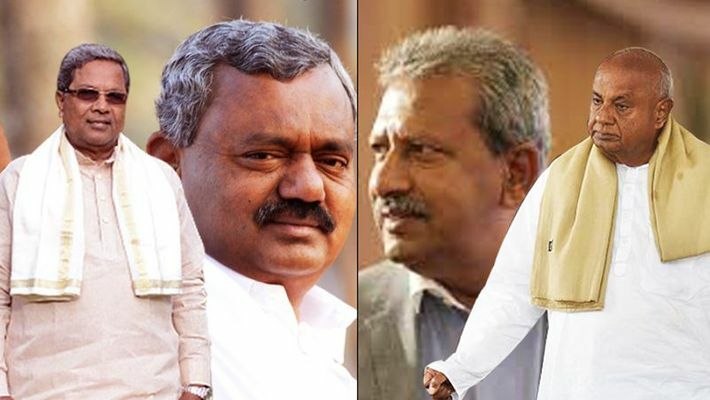 JD(S) thought that bagging the Bengaluru North seat from the coalition would be easy for the JD(S) chief but now, the defeat of Siddaramaiah in his own turf and the presence of his allegedly vengeful followers ruling in three MLA segments in Bengaluru North may prove difficult for Deve Gowda to beat the odds in this Lok Sabha election. In Tumakuru, the Congress denied the seat to sitting MP SP Muddahanumegowda and that has antagonised many Congressmen and may work against the Coalition candidate. Having won three Assembly seats in the constituency, the JD(S) may still look confident, but the BJP is equally strong in Tumakuru with four MLAs. Moreover, devotees of the Siddaganga Mutt and the Lingayats in Tumakuru who usually identify better with the BJP, especially after BS Yeddyurappa came to power in 2008 may not lend their support to Deve Gowda. Chancing upon this troublesome situation, the BJP says Deve Gowda will become irrelevant after May 2019. BJP Spokesperson S Prakash said, "The lack of trust between the Congress and the JD(S) will work in BJP's favour. Time and again both parties tried to outdo each other even after forming a coalition. Deve Gowda will become a non-player after the election." However, Congress says that these are just off-the-cuff remarks, and this will not impact the elections. "There is enough of trust between the two parties and we will work together and ensure the victory of our Coalition candidates. With regard to avenging the defeat of Siddaramaiah, this is not true, and it should not be blown out of proportion," said Dinesh Gundu Rao. JD(S) also agreed that the party thinks that Deve Gowda may be projected as a rural man by the BJP during elections to misguide urban voters. "Deve Gowda wanted to rest and make way for Prajwal Revanna as he has potential, but with pressure from party workers and leaders, he agreed to contest. Gowda has been projected as the son of the soil all this while. Our concern is that the BJP may distract urban voters by using their cheap tricks. With regard to Siddaramaiah's followers trying to avenge his defeat, this is all false. In Tumakuru too we have a base, it is up to Deve Gowda from where he wants to contest, but he will win," said Mohid Altaf, Special Representative to Government of Karnataka to Delhi. Congressman S P Muddahanumegowda won with 429,868 votes.